Natural additives are increasingly favoured over synthetic ones as methods of ensuring food safety and long shelf-life. The antimicrobial properties of both plant-based antimicrobials such as essential oils and proteins such as bacteriocins are used in, for example, edible preservative films, in food packaging and in combination with synthetic preservatives for maximum efficacy. New developments in delivery technology such as nanoencapsulation also increase the potential of natural antimicrobials for widespread use in industry. Part one introduces the different types of natural antimicrobials for food applications. Part two covers methods of application, and part three looks at determining the effectiveness of natural antimicrobials in food. 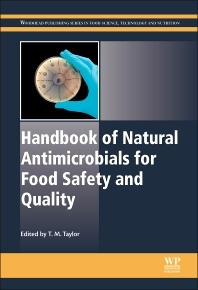 Part four focuses on enhancing quality and safety, and includes chapters on specific food products. R&D managers in the food industry, food industry professionals responsible for product safety, product development professionals working with clean-label or ‘natural’ products and academic researchers with an interest in this area.